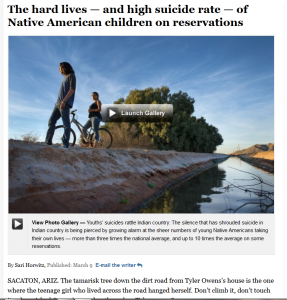 [T]he silence that has shrouded suicide in Indian country is being pierced by growing alarm at the sheer number of young Native Americans taking their own lives — more than three times the national average, and up to 10 times on some reservations. Read the statement from the National Indian Child Welfare Association clarifying the child maltreatment statistics included in this article. This entry was posted in News and tagged Byron Dorgan, Gila River. Bookmark the permalink.